​Nothing beats an intensive hair mask for injecting moisture into dry hair. 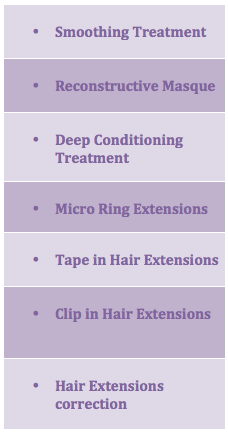 Each in-salon conditioning service is tailored to your hair’s particular needs. You will notice immediate results—hair is healthier, shinier, softer, fuller and hydrated. Add to any hair service. Hair extensions services employ realistic looking synthetic locks to give you beautiful long hair without the wait. Extensions can be added to allow dramatic special effects and up dos, which may not be possible with your natural hair length and type.